This Checkered Knit Blanket will look fantastic in your living room! 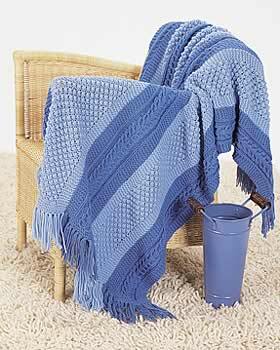 Use this free knitting pattern from Bernat Yarns to create a quick and easy knit blanket. Thrown over a couch or chair in your living room, this blanket will be the finishing touch to tie the room together and add an extra splash of color. You could customize the colors of your classy knit blanket to match the room or tailor it to match the current season. You'll love snuggling up under this afghan with your loved ones on a cool evening. our favorite 59 Free Scarf Knitting Patterns. Size 5 mm (U.S. 8) circular knitting needle 36 ins [90 cm] long or size needed to obtain gauge. Approx 45 x 58" [114.5 x 147.5 cm]. With MC, cast on 42 sts. **2nd row: K1. *(K1. P1. K1) in next st. P3tog. Rep from * to last st. K1. 4th row: K1. *P3tog. (K1. P1. K1) in next st. Rep from * to last st. K1. Rep last 4 rows of Trinity Stitch Pat for 9 ins [23 cm], ending with a 4th row. 1st row: (RS). K3. *Sl1. K3. Rep from * to last 3 sts. Sl1. K2. Rep from ** to ** twice more, changing colors as follows: B, C, D, E. Cast off knitwise. With C, cast on 42 sts. ***1st row: (RS). K2. *Sl1. K3. Rep from * to end of row. Rep last 2 rows of Ridge Pat for 9 ins [23 cm], ending with 1st row. 1st row: (WS). K1.*(K1. P1. K1) in next st. P3tog. Rep from * to last st. K1. 3rd row: K1.*P3tog. (K1. P1. K1) in next st. Rep from * to last st. K1. Rep from *** to *** twice more, changing colors as follows: E, F, MC, A. Cast off knitwise. Work as given for Panel I, working colors in the following sequence: F, MC, A, B, C, D. Cast off knitwise. Work as given for Panel II, working colors in the following sequence: B, C, D, E, F, MC. With MC, cast off knitwise. Work as given for Panel I, working colors in the following sequence: E, F, MC, A, B, C. Cast off knitwise. Sew panels tog in following sequence: I, II, III, IV, V.
With RS of work facing and MC, beg at lower right corner of Blanket, pick up and knit 200 sts evenly along right side of Blanket. Knit 1 row. Knit 2 rows of each color as follows: A, B, C, D, E. With F, knit 1 row. Cast off knitwise (WS). Rep for left side of blanket. With RS facing and MC, beg at right side edging of Blanket, pick up and knit 180 sts evenly across upper edge of Blanket. Work as given for side edging. Rep for lower edge. Check out these other amazing blankets: 66 Fantastic Free Afghan Patterns + 5 New Crochet Afghan Patterns. I love the patchwork afghans to hone my knitting skills, learn new stitches and to bust my ever growing stash of yarn. This is a nice size blanket to cuddle under while watching TV or knitting, plus its elegant enough to be used as a decorative throw over the back of your favorite chair. With fewer blocks you can make a crib blanket to match a special nursery. This is another really easy pattern. I have used the pattern instructions as a base to use up all my scrap wool this year and have ended up with 5 of them - guess what everyone's getting for Christmas LOL. I am planning one in the actual colours and wool you suggested for my sister's living room now. Having trouble sourcing the yarn as I want to make this in the colours shown. Has anyone got alternate yarn that works up the same shades? The panels themselves can be knit on straight needles, they are only a 42 stitch cast on, the circulars would be absolutely necessary for the edging because you are picking up 200 stitches on one side of the blanket, nothing will change in the pattern knitting with straights instead of circ's because there is no join. I know this is late hope it helps someone. IT looks a lovely pattern.Isi it not possible to put into my I Book.Am new to computers so still learning!! This is very easy but I have only gotten as f a r as knitting the panels. Does anyone have any helpful tips on how to sew the panels together? What color yarn do you use? I usually make sweaters in one piece, a front, a back, and the other front. No side/shoulder seams and sleeves exactly the same number of rows. As for afghans, sometimes you can't knit all the squares at the same time, though. I have made one with a greek key border that I could only make in strips and sew together. It doesn't work when the panels are all different sizes like a Mondrian-inspired blankie, either. There is also the fact that the project can get very heavy and tiring on your arms and hands. You can't take a 40-inch thing along to do on the bus like you can a foot-square or a slim panel, especially if the bus gets crowded, either. Christivas when you knit or crochet squares all together at the same time, do you drop one color and pick up the next as you go across the rows?